WordPress is a great website and blogging platform, but sometimes things can go wrong, and you will need a good backup of your site so you can restore it. Your website might get hacked. You might install a plugin that crashes your website. Or, maybe your webhost disappears one day – it happens! 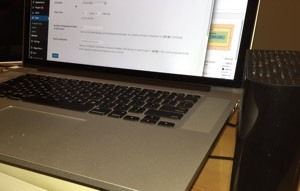 The following tutorial explains how to Backup WordPress so you will be prepared for a disaster. There are many plugins that help you backup WordPress. My favorite is the BackUpWordPress plugin. I have been using it for several years: it’s simple, it’s reliable, it’s automatic, and it’s free. You can download a zip file of any backup. Install the BackUpWordPress plugin. For more information, see How to Install WordPress Plugins. For the WordPress admin screen, go to Tools > Backups. The BackUpWordPress screen is displayed. By default, the plugin creates two schedules: Database Daily and Complete Weekly. Click Database Daily > Settings. In the Number of backups to store on this server field, change 7 to 21. By changing it to 21 days, you’ll have 3 weeks of database backups. Optional: If you want to receive emails whenever this schedule creates a backup, enter your email address in the Email Notification field. Click Run Now to create your first database backup. Wait until the backup is complete and then click Download to save the database backup on your computer. Click Complete Weekly > Settings. In the Number of backups to store on this server field, change 3 to 8 and then click Done. By changing 3 to 8, you’ll have 2 months of complete backups. Storing 2 months of complete backups is important: if your site gets hacked, it might be weeks before you find out. If you have 8 weeks of complete backups, it’s more likely that you can find a clean copy of your site if you go back far enough. Important: The complete backup contains all WordPress files, including images files, and the database. If you website files or database take up a lot of storage – 500 megs to 1 gig – you might not be able to store multiple complete backups on your web hosting account. Check your hosting plan to find out how much storage you have. Many shared hosting services provide unlimited storage. If you run out of storage space on your hosting account, backups will fail. Optional – You can exclude files or directories from the backup. Click Excludes to set files or folders to exclude. You might want to do this if you have files or folders that are not part of your WordPress installation. Click Run Now to create your first complete backup. Wait until the backup is complete and then click Download to save the complete backup on your computer. 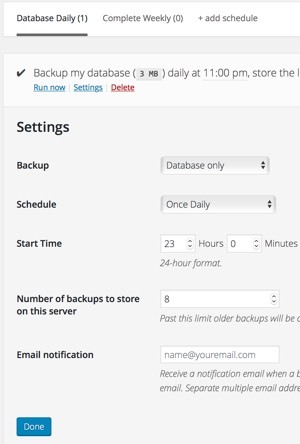 Now your backups are set to run automatically according to the schedules. For $24, you can buy a BackUpWordPress plugin that will automatically store the backups to a remote storage service like Dropbox or Google Drive. It still keeps the backups on your web server based on the schedules settings. In addition, you can specify the number of backups stored on, for example, DropBox. The advantage of storing the backups on storage service is that you’ll have your backups in a second location. This might seem like overkill. But if your web host has a server crash or they go out of business, or, for some reason, you cannot access the backups stored on your web host, you will have a second storage area. Important: If you don’t want to buy a plugin that stores your backups to a remote location, then once a week, or whenever you make changes to your web site, you should log into your WordPress site and download copies of the backups to your computer.